Abstract: Multifocal motor neuropathy (MMN) is a debilitating and rare disease causing profound weakness with minimal to no sensory symptoms. Conduction block is frequently seen on electrodiagnostic testing. An immune-mediated pathology is suspected though the exact underlying pathophysiology has yet to be elucidated. The presence of anti-GM1 ganglioside IgM antibodies coupled with favorable response to intravenous and subcutaneous immunoglobulins supports a complement-mediated mechanism which leads to destruction of nerve tissue with probable predilection to the nodes of Ranvier. High-dose immunoglobulin currently is the only treatment with proven efficacy for MMN patients. Unfortunately, many patients experience decreased responsiveness to immunoglobulins over time, requiring higher and more frequent dosing. In this review, we will focus on the pharmacology, efficacy, safety, and tolerability of intravenous and subcutaneous immune globulin infusion for treatment of MMN. Abbreviations: IVIG, intravenous immunoglobulin; SCIG, subcutaneous immunoglobulins. MMN typically follows a chronic progressive course. However, some patients may present with an acute form of the disease. The goal of treatment is to improve motor deficits by reducing conduction block, slowing axonal degeneration, and promoting reinnervation. Most patients require treatment for many years though some do achieve prolonged remission.16 The mainstay of treatment is intravenous immunoglobulin (IVIG) or subcutaneous immunoglobulin (SCIG). Other treatments which have been investigated include corticosteroids and plasma exchange. These currently are not recommended due to potential to worsen weakness. Cyclophosphamide, mycophenolate mofetil (MMF), rituximab, and eculizumab have been explored as well though all have worse side effect profiles and are not as effective as IVIG or SCIG which remain the gold standard treatments for MMN.6 In some patients, IVIG may lose its efficacy. In those patients, IV cyclophosphamide may reset the immune system and provide prolonged recovery.11 In this review, we will focus on the pharmacology, efficacy, safety, and tolerability of IVIG and SCIG infusion for treatment of MMN. As with MMN, the exact mechanism by which IVIG affects immunomodulation in the treatment of MMN and other inflammatory neuropathies is not fully understood, though several mechanisms have been proposed. IVIG contains antibodies against components of the classical complement pathway to prevent membrane attack complex formation leading to tissue degradation at the axolemma.23,24 The presence of anti-GM1 ganglioside IgM antibodies and possible complement-mediated mechanism described suggests the effect of IVIG on the complement pathway may play a significant role in its efficacy for treating MMN as shown in Figure 1. 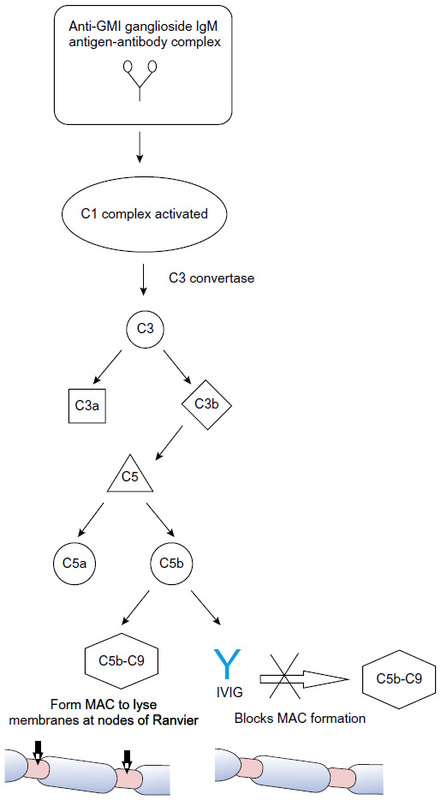 Figure 1 Proposed mechanism of IVIG within the classical complement pathway for treatment of multifocal motor neuropathy. Abbreviations: IVIG, intravenous immunoglobulin; MAC, membrane attack complex. MMN typically responds well to treatment with IVIG; however, the degree of recovery is variable, and optimal dosing and treatment intervals for IVIG maintenance therapy have not conclusively been established.35 In our experience, patients treated early in their disease, ie, prior to significant muscle atrophy, tend to do better than patients treated later when atrophy clearly is present. Increased IgG concentration (ΔIgG) after IVIG infusion recently was identified as a major factor in determining outcomes of IVIG therapy for GBS36 and some posit ΔIgG could be a useful indicator for optimizing outcomes of IVIG therapy and dosing for treatment of MMN.37 A recent small study37 examined the variability of IVIG pharmacokinetics among MMN patients relative to treatment response. ΔIgG was greater in patients who responded favorably to IVIG treatment. Researchers also examined if variability in pharmacokinetics was associated with genetic polymorphisms in the endothelial IgG receptor (FcRn), a determinant of IgG half-life. IVIG likely saturates these receptors, thereby accelerating the degradation of endogenous IgG and potentially balancing immune function.38 Researchers found no association of ΔIgG levels and responsiveness to treatment with genetic variation in the FcRn gene. However, there was a high degree of variability in ΔIgG levels among patients who received identical dosing protocols as the underlying mechanisms behind variable IVIG efficacy and metabolism have yet to be elucidated. This poses a challenge for establishing standardized treatment dosages and interval protocols. A 2008 retrospective study (Study A, Table 2) examined dosing in 40 patients with MMN, 22 of whom were IVIG naïve.44 A cumulative dose of 2 g/kg IVIG was effective in 70% of patients. Though not statistically significant, researchers found that positive predictors for favorable response to IVIG were female and lower Medical Research Council (MRC) muscle strength scores. No correlation was found between electrophysiological findings of conduction block and clinical improvements in this study, though correlation has been found in other trials. 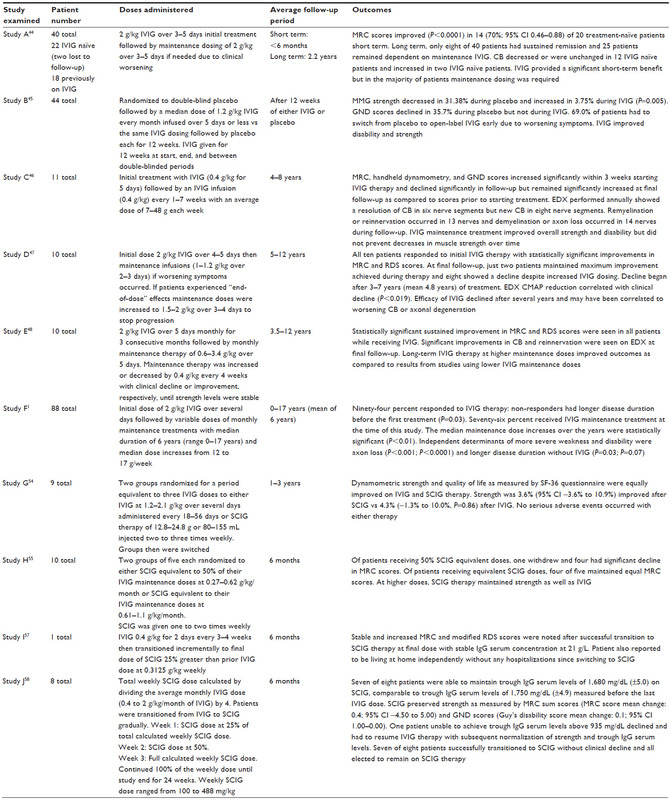 A recent randomized, double-blind, controlled trial45 from 2013 (Study B, Table 2) assessed efficacy, safety, and tolerability of 10% liquid IVIG. Forty-four patients were randomized to 12 weeks of treatment with IVIG followed by 12 weeks of placebo or vice versa. To ensure stability, all patients received IVIG for 12 weeks at the beginning and end of the study. To prevent carry-over effects, IVIG also was given between the two double-blind 12-week periods. While on IVIG, patients’ mean maximal grip strength increased by nearly 4% and while on placebo it declined by approximately 31% (P=0.005). Using Guy’s Neurological Disability Scale to assess disability related to upper limb function, researchers found a significant number of subjects worsened while on placebo with over two-thirds of participants needing to stop placebo prematurely and resume IVIG therapy. These findings supported researchers’ conclusions that IVIG significantly improves muscle strength and function in MMN patients. Abbreviations: IVIG, intravenous immunoglobulin; SCIG, subcutaneous immunoglobulins; MMN, multifocal motor neuropathy; MRC, Medical Research Council Scoring for muscle strength; CB, conduction block; CI, confidence interval; MMG, mean maximal grip strength; GND, Guy’s Neurological Disability scores for upper extremities; EDX, electrodiagnostic studies; RDS, Rankin Disability Scale; CMAP, distal compound muscle action potential amplitudes. While effective, IVIG is not without associated risks, which include potentially life threatening complications such as thromboembolic events and anaphylaxis. Intravenous administration is also expensive and burdensome, requiring patients to be monitored closely in a hospital or clinic setting while undergoing infusion. Because of these risks, expenses, and logistical burdens, a popular alternative is subcutaneous administration of immunoglobulins which can be self-administered at home. Eculizumab, a monoclonal antibody successfully used to treat complement-mediated disorders, has shown some promise as an adjunctive therapy. Eculizumab binds to and inactivates complement factor C5, thereby blocking terminal complement activation and subsequent lysis of membranes via membrane attack complexes in a manner similar to the complement-mediated mechanism of IVIG outlined in Figure 1. A single small clinical trial61 of 14 patients with aggressive neuromyelitis optica, a complement-mediated disease, demonstrated favorable responses including reduced frequency of attacks and disability scores following treatment with eculizumab. Further studies including a Phase III randomized, double-blind, open-label clinical trial have yet to be completed.62 Similarly, studies of eculizumab’s efficacy in treating myasthenia gravis (MG), another complement-mediated disease, are limited. A single pilot Phase II trial63 of eculizumab in 14 patients with severe MG refractory to other treatments demonstrated significant clinical benefits of increased strength and functionality for patients receiving eculizumab as compared to those receiving placebo. As discussed previously, a proposed mechanism of MMN involves anti-GM1 ganglioside IgM antibodies activating complement-mediated destruction of axolemmal membranes. Inhibition of the complement cascade could protect motor nerves.16 A 2011 open-label clinical trial was conducted testing eculizumab over a period of 14 weeks on 13 MMN patients. Of the patients included in the study, ten were concurrently receiving maintenance therapy with IVIG.64 Improvements were noted in patient-rated subjective scores, myometric measurements of muscle strength, and prevalence of nerves with conduction block on electrodiagnostic testing. Researchers noted a small treatment effect in patients with higher baseline motor function whether eculizumab was used in conjunction with or independent of IVIG. Given limited available studies of eculizumab for treatment of MMN, MG, and neuromyelitis optica, it is difficult to compare efficacy for the drug among these disorders though the preliminary data suggest that eculizumab may be a promising treatment for all of these conditions. Treatment with rituximab, a monoclonal antibody against CD20 surface antigen for B-cell apoptosis, has also demonstrated some clinical improvement in patients with diminishing or insufficient responsiveness to IVIG. However, reports of efficacy are inconsistent and based on a small number of patients. Established dosing recommendations call for 375 mg/m2 weekly for 2–4 weeks for B-cell depletion with single booster doses of 375 mg/m2 given for maintenance if patients develop worsening weakness. The largest study65 with 14 patients showed strength improved by 13% in patients taking rituximab as compared to 3% in controls over 1 year. Strength improved 23% over 2 years. However, the next largest study66 with six IVIG responsive patients showed no significant improvement in strength and patients could not have their IVIG dosage reduced while on adjuvant therapy. Though cyclophosphamide carries a much greater risk of toxicity compared to rituximab, there is evidence of its efficacy for treating MMN even in patients with no response to IVIG.9 High-dose but not low-dose IV cyclophosphamide has been shown to be effective in up to half of patients in small uncontrolled trials.67,68 Unfortunately, use of high-dose IV cyclophosphamide is limited due to its toxicity, which include bone marrow suppression, hemorrhagic cystitis, bladder cancer, risk of infection, teratogenic effects, and infertility. In the studies listed earlier, several patients involved experienced severe side effects. IVIG carries risks of adverse side effects with initial dosing and maintenance therapy. There is always potential for anaphylaxis, though risks are increased for patients with anti-IgA antibodies and selective IgA deficiency.69,70 More commonly, patients can develop flu-like symptoms9 and should be offered symptomatic therapy. MMN profoundly affects patients’ ability to function and definitive diagnosis can be difficult. Due to focal distribution, patients frequently are misdiagnosed with entrapment mononeuropathies despite lack of sensory symptoms and may undergo unnecessary surgeries before being correctly diagnosed.5 Progressive weakness coupled with fasciculations and cramping can lead to misdiagnosis of ALS. Many patients labor under an ALS diagnosis for years prior to receiving the correct determination of MMN.83 Median time from symptom onset to diagnosis is approximately 4 years.5 Though IVIG is highly effective in reversing symptoms, the longer the treatment is delayed, typically, the less effective IVIG will be.1 Univariate analysis from a 2010 study1 suggested a correlation with greater severity of disability and greater length of time untreated; thus, earlier diagnosis is crucial and could prevent patients from acquiring debilitating impairments. Nearly one-fifth of patients in this study were found to have severe disability on the Overall Disability Sum Score due to profound upper extremity weakness. Another study84 from 2010 evaluated how patients’ weakness impacted their daily functioning. This cross-sectional study examined 47 patients with MMN and found that, in addition to muscle weakness, overall functionality was affected by multiple factors including fatigue, impairments in dexterity, and impaired ambulation. Fatigue, a factor often overlooked, had a significant impact. Some electrodiagnostic studies have demonstrated activity-dependent conduction block12 which may relate to fatigue.9 Though fatigue was an ever-present issue, use of gait and hand aids significantly improved scores for autonomy and 94% of these patients were employed. MMN clearly impacts strength and functionality, but there continues to be no consensus on how to evaluate degree of disability and quality of life for patients. Progress has been made however and in 2013 at the 196th ENMC International workshop, a panel of experts recommended that the primary outcome of patient activity and participation levels be measured by the disease-specific Rasch-built Overall Disability Scale (R-ODS).85 These researchers anticipate creating a Rasch-transformed quality of life scale based on findings of future studies to help standardize assessments of quality of life, a parameter which is essential but difficult to quantify.9,85 Using these standardized measurements hopefully will provide a more reliable method with which to assess patients’ functioning, thereby making it easier to tailor interventions such as walking and hand aids, physical and occupational therapies, and immunoglobulin dosing protocols to better meet their needs. MMN is a rare but treatable neuropathy. Early diagnosis and treatment is a crucial factor for preserving strength and functionality long term. It is critical to recognize MMN’s unique symptoms and to differentiate MMN from mimicking conditions such as compression neuropathies and ALS for which immunomodulatory therapies are not effective. The only proven treatments available at present are IVIG and SCIG. Further studies are needed to determine optimum steady-state IgG serum concentrations for therapy as well as the best individual doses, dosing intervals, and routes of administration to achieve these concentrations. Though effective, IVIG and SCIG are costly to produce and administer. Unfortunately, patients still typically experience progressive motor decline due to diminished responsiveness to treatment over time. Patients often require higher and more frequent doses, thereby increasing the risk of adverse and potentially fatal outcomes including myocardial infarction and stroke. Research to elucidate the underlying pathophysiology behind MMN is ongoing. Hopefully, a more complete understanding of disease mechanisms will lead to development of more targeted and economical treatments with lasting effectiveness. For now, IVIG and SCIG remain the first-line agents for treatment of MMN. Cats EA, van der Pol WL, Piepers S, et al. Correlates of outcome and response to IVIg in 88 patients with multifocal motor neuropathy. Neurology. 2010;75(9):818–825. Moroni I, Bugiani M, Ciano C, Bono R, Pareyson D. Childhood-onset multifocal motor neuropathy with conduction blocks. Neurology. 2006;66(6):922–924. Nguyen TP, Chaudhry V. Multifocal motor neuropathy. Neurol India. 2011;59(5):700–706. Vlam L, van der Pol WL, Cats EA, et al. Multifocal motor neuropathy: diagnosis, pathogenesis and treatment strategies. Nat Rev Neurol. November 22, 2011;8(1):48–58. Taylor BV, Wright RA, Harper CM, Dyck PJ. Natural history of 46 patients with multifocal motor neuropathy with conduction block. Muscle Nerve. 2000;23(6):900–908. Joint Task Force of the EFNS and the PNS. European federation of neurological societies/peripheral nerve society guideline on management of multifocal motor neuropathy. Report of a joint task force of the european federation of neurological societies and the peripheral nerve society – first revision. J Peripher Nerv Syst. 2010;15(4):295–301. Pringle CE, Belden J, Veitch JE, Brown WF. Multifocal motor neuropathy presenting as ophthalmoplegia. Muscle Nerve. 1997;20(3):347–351. Straver DC, van Asseldonk JT, Notermans NC, Wokke JH, van den Berg LH, Franssen H. Cold paresis in multifocal motor neuropathy. J Neurol. 2011;258(2):212–217. Lawson VH, Arnold WD. Multifocal motor neuropathy: a review of pathogenesis, diagnosis, and treatment. Neuropsychiatr Dis Treat. 2014;10:567–576. Galassi G, Girolami F, Ariatti A, Monelli M, Sola P. Fulminant multifocal motor neuropathy: a report of two cases. Int J Neurosci. 2012;122(7):395–400. Karam C, Dyck PJ, Engelstad JK, Macgowan DJ. Clinical reasoning: a 34-year-old man with recurrent limb weakness. Neurology. 2011; 77(12):e68–e72. Kaji R, Bostock H, Kohara N, Murase N, Kimura J, Shibasaki H. Activity-dependent conduction block in multifocal motor neuropathy. Brain. 2000;123(Pt 8):1602–1611. Straver DC, van den Berg LH, van den Berg-Vos RM, Franssen H. Activity-dependent conduction block in multifocal motor neuropathy. Muscle Nerve. 2011;43(1):31–36. Delmont E, Azulay JP, Giorgi R, et al. Multifocal motor neuropathy with and without conduction block: a single entity? Neurology. 2006; 67(4):592–596. Slee M, Selvan A, Donaghy M. Multifocal motor neuropathy: the diagnostic spectrum and response to treatment. Neurology. 2007;69(17):1680–1687. Leger JM, Guimaraes-Costa R, Iancu Ferfoglia R. The pathogenesis of multifocal motor neuropathy and an update on current management options. Ther Adv Neurol Disord. 2015;8(3):109–122. Taylor BV, Dyck PJ, Engelstad J, Gruener G, Grant I, Dyck PJ. Multifocal motor neuropathy: pathologic alterations at the site of conduction block. J Neuropathol Exp Neurol. 2004;63(2):129–137. Auer RN, Bell RB, Lee MA. Neuropathy with onion bulb formations and pure motor manifestations. Can J Neurol Sci. 1989;16(2):194–197. Takigawa T, Yasuda H, Terada M, et al. Increases in K+ conductance and Ca2+ influx under high glucose with suppressed Na+/K+-pump activity in rat myelinated nerve fibers. Neuroreport. 2000;11(11):2547–2551. O’Hanlon GM, Humphreys PD, Goldman RS, et al. Calpain inhibitors protect against axonal degeneration in a model of anti-ganglioside antibody-mediated motor nerve terminal injury. Brain. 2003;126(Pt 11):2497–2509. Vlam L, Cats EA, Harschnitz O, et al. Complement activity is associated with disease severity in multifocal motor neuropathy. Neurol Neuroimmunol Neuroinflamm. 2015;2(4):e119. Jacob S, Rajabally YA. Current proposed mechanisms of action of intravenous immunoglobulins in inflammatory neuropathies. Curr Neuropharmacol. 2009;7(4):337–342. Halstead SK, Zitman FM, Humphreys PD, et al. Eculizumab prevents anti-ganglioside antibody-mediated neuropathy in a murine model. Brain. 2008;131(Pt 5):1197–1208. Yuki N, Watanabe H, Nakajima T, Spath PJ. IVIG blocks complement deposition mediated by anti-GM1 antibodies in multifocal motor neuropathy. J Neurol Neurosurg Psychiatry. 2011;82(1):87–91. Malik U, Oleksowicz L, Latov N, Cardo LJ. Intravenous gamma-globulin inhibits binding of anti-GM1 to its target antigen. Ann Neurol. 1996;39(1):136–139. Kondo N, Kasahara K, Kameyama T, et al. Intravenous immunoglobulins suppress immunoglobulin productions by suppressing Ca(2+)-dependent signal transduction through fc gamma receptors in B lymphocytes. Scand J Immunol. 1994;40(1):37–42. Stohl W, Elliot JE. In vitro inhibition by intravenous immunoglobulin of human T cell-dependent B cell differentiation induced by staphylococcal superantigens. Clin Immunol Immunopathol. 1996;79(2):122–133. Vassilev T, Yamamoto M, Aissaoui A, et al. Normal human immunoglobulin suppresses experimental myasthenia gravis in SCID mice. Eur J Immunol. 1999;29(8):2436–2442. Korporal-Kuhnke M, Haas J, Schwarz A, Jarius S, Wildemann B. Plasmacytosis is a common immune signature in patients with MMN and CIDP and responds to treatment with IVIg. J Neuroimmunol. 2015;278:60–68. De Groot AS, Cousens L, Mingozzi F, Martin W. Tregitope peptides: the active pharmaceutical ingredient of IVIG? Clin Dev Immunol. 2013;2013:493138. Tjon AS, Tha-In T, Metselaar HJ, et al. Patients treated with high-dose intravenous immunoglobulin show selective activation of regulatory T cells. Clin Exp Immunol. 2013;173(2):259–267. Crow AR, Song S, Semple JW, Freedman J, Lazarus AH. A role for IL-1 receptor antagonist or other cytokines in the acute therapeutic effects of IVIg? Blood. 2007;109(1):155–158. Creange A, Gregson NA, Hughes RA. Intravenous immunoglobulin modulates lymphocyte CD54 and monocyte FcgammaRII expression in patients with chronic inflammatory neuropathies. J Neuroimmunol. 2003;135(1–2):91–95. Vassilev TL, Kazatchkine MD, Duong Van Huyen JP, et al. Inhibition of cell adhesion by antibodies to arg-gly-asp (RGD) in normal immunoglobulin for therapeutic use (intravenous immunoglobulin, IVIg). Blood. 1999;93(11):3624–3631. Kerr J, Quinti I, Eibl M, et al. Is dosing of therapeutic immunoglobulins optimal? A review of a three-decade long debate in Europe. Front Immunol. 2014;5:629. Kuitwaard K, de Gelder J, Tio-Gillen AP, et al. Pharmacokinetics of intravenous immunoglobulin and outcome in Guillain-Barre syndrome. Ann Neurol. 2009;66(5):597–603. Vlam L, Cats EA, Willemse E, et al. Pharmacokinetics of intravenous immunoglobulin in multifocal motor neuropathy. J Neurol Neurosurg Psychiatry. 2014;85(10):1145–1148. Yu Z, Lennon VA. Mechanism of intravenous immune globulin therapy in antibody-mediated autoimmune diseases. N Engl J Med. 1999;340(3):227–228. Leger JM, Viala K, Maisonobe T, Bouche P. Multifocal motor neuropathy: a retrospective study of the response to high-dose intravenous immunoglobulin (IVIg) and current perspectives for diagnosis and treatment. Bull Acad Natl Med. 2007;191(7):1395–1407; discussion 1407-9. Donofrio PD, Berger A, Brannagan TH 3rd, et al. Consensus statement: the use of intravenous immunoglobulin in the treatment of neuromuscular conditions report of the AANEM ad hoc committee. Muscle Nerve. 2009;40(5):890–900. Leger JM, Chassande B, Musset L, Meininger V, Bouche P, Baumann N. Intravenous immunoglobulin therapy in multifocal motor neuropathy: a double-blind, placebo-controlled study. Brain. 2001;124(Pt 1):145–153. Federico P, Zochodne DW, Hahn AF, Brown WF, Feasby TE. Multifocal motor neuropathy improved by IVIg: randomized, double-blind, placebo-controlled study. Neurology. 2000;55(9):1256–1262. van Schaik IN, van den Berg LH, de Haan R, Vermeulen M. Intravenous immunoglobulin for multifocal motor neuropathy. Cochrane Database Syst Rev. 2005;(2)(2):CD004429. Leger JM, Viala K, Cancalon F, et al. Intravenous immunoglobulin as short- and long-term therapy of multifocal motor neuropathy: a retrospective study of response to IVIg and of its predictive criteria in 40 patients. J Neurol Neurosurg Psychiatry. 2008;79(1):93–96. Hahn AF, Beydoun SR, Lawson V, et al. A controlled trial of intravenous immunoglobulin in multifocal motor neuropathy. J Peripher Nerv Syst. 2013;18(4):321–330. Van den Berg-Vos RM, Franssen H, Wokke JH, Van den Berg LH. Multifocal motor neuropathy: long-term clinical and electrophysiological assessment of intravenous immunoglobulin maintenance treatment. Brain. 2002;125(Pt 8):1875–1886. Terenghi F, Cappellari A, Bersano A, Carpo M, Barbieri S, Nobile-Orazio E. How long is IVIg effective in multifocal motor neuropathy? Neurology. 2004;62(4):666–668. Van Asseldonk JT, Van den Berg LH, Kalmijn S, et al. Axon loss is an important determinant of weakness in multifocal motor neuropathy. J Neurol Neurosurg Psychiatry. 2006;77(6):743–747. Baumann A, Hess CW, Sturzenegger M. IVIg dose increase in multifocal motor neuropathy: a prospective six month follow-up. J Neurol. 2009;256(4):608–614. Vucic S, Black KR, Chong PS, Cros D. Multifocal motor neuropathy: decrease in conduction blocks and reinnervation with long-term IVIg. Neurology. 2004;63(7):1264–1269. Vlam L, van den Berg LH, Cats EA, Piepers S, van der Pol WL. Immune pathogenesis and treatment of multifocal motor neuropathy. J Clin Immunol. 2013;33(Suppl 1):S38–S42. Nowacek DG, Teener JW. Multifocal motor neuropathy. Semin Neurol. 2012;32(5):500–505. Nobile-Orazio E, Gallia F. Multifocal motor neuropathy: current therapies and novel strategies. Drugs. 2013;73(5):397–406. Harbo T, Andersen H, Hess A, Hansen K, Sindrup SH, Jakobsen J. Subcutaneous versus intravenous immunoglobulin in multifocal motor neuropathy: a randomized, single-blinded cross-over trial. Eur J Neurol. 2009;16(5):631–638. Eftimov F, Vermeulen M, de Haan RJ, van den Berg LH, van Schaik IN. Subcutaneous immunoglobulin therapy for multifocal motor neuropathy. J Peripher Nerv Syst. 2009;14(2):93–100. Dimberg EL. Treatment of multifocal motor neuropathy with immunoglobulin: does route of administration matter? Eur J Neurol. 2009; 16(5):553–554. Dacci P, Riva N, Scarlato M, et al. Subcutaneous immunoglobulin therapy for the treatment of multifocal motor neuropathy: a case report. Neurol Sci. 2010;31(6):829–831. Misbah SA, Baumann A, Fazio R, et al. A smooth transition protocol for patients with multifocal motor neuropathy going from intravenous to subcutaneous immunoglobulin therapy: an open-label proof-of-concept study. J Peripher Nerv Syst. 2011;16(2):92–97. Piepers S, Van den Berg-Vos R, Van der Pol WL, Franssen H, Wokke J, Van den Berg L. Mycophenolate mofetil as adjunctive therapy for MMN patients: a randomized, controlled trial. Brain. 2007;130(Pt 8):2004–2010. Umapathi T, Hughes RA, Nobile-Orazio E, Leger JM. Immunosuppressant and immunomodulatory treatments for multifocal motor neuropathy. Cochrane Database Syst Rev. 2015;3:CD003217. Pittock SJ, Lennon VA, McKeon A, et al. Eculizumab in AQP4-IgG-positive relapsing neuromyelitis optica spectrum disorders: an open-label pilot study. Lancet Neurol. 2013;12(6):554–562. Sherman E, Han MH. Acute and chronic management of neuromyelitis optica spectrum disorder. Curr Treat Options Neurol. 2015;17(11):48,015-0378-x. Howard JF Jr, Barohn RJ, Cutter GR, et al. A randomized, double-blind, placebo-controlled phase II study of eculizumab in patients with refractory generalized myasthenia gravis. Muscle Nerve. 2013; 48(1):76–84. Fitzpatrick AM, Mann CA, Barry S, Brennan K, Overell JR, Willison HJ. An open label clinical trial of complement inhibition in multifocal motor neuropathy. J Peripher Nerv Syst. 2011;16(2):84–91. Pestronk A, Florence J, Miller T, Choksi R, Al-Lozi MT, Levine TD. Treatment of IgM antibody associated polyneuropathies using rituximab. J Neurol Neurosurg Psychiatry. 2003;74(4):485–489. Chaudhry V, Cornblath DR. An open-label trial of rituximab (rituxan(R)) in multifocal motor neuropathy. J Peripher Nerv Syst. 2010;15(3):196–201. Feldman EL, Bromberg MB, Albers JW, Pestronk A. Immunosuppressive treatment in multifocal motor neuropathy. Ann Neurol. 1991;30(3):397–401. Pestronk A, Cornblath DR, Ilyas AA, et al. A treatable multifocal motor neuropathy with antibodies to GM1 ganglioside. Ann Neurol. 1988;24(1):73–78. Rachid R, Bonilla FA. The role of anti-IgA antibodies in causing adverse reactions to gamma globulin infusion in immunodeficient patients: a comprehensive review of the literature. J Allergy Clin Immunol. 2012;129(3):628–634. Spath PJ, Granata G, La Marra F, Kuijpers TW, Quinti I. On the dark side of therapies with immunoglobulin concentrates: the adverse events. Front Immunol. 2015;6:11. Orbach H, Katz U, Sherer Y, Shoenfeld Y. Intravenous immunoglobulin: adverse effects and safe administration. Clin Rev Allergy Immunol. 2005;29(3):173–184. Rajabally YA, Kearney DA. Thromboembolic complications of intravenous immunoglobulin therapy in patients with neuropathy: a two-year study. J Neurol Sci. 2011;308(1–2):124–127. Ramirez E, Romero-Garrido JA, Lopez-Granados E, et al. Symptomatic thromboembolic events in patients treated with intravenous-immunoglobulins: results from a retrospective cohort study. Thromb Res. 2014;133(6):1045–1051. Marie I, Maurey G, Herve F, Hellot MF, Levesque H. Intravenous immunoglobulin-associated arterial and venous thrombosis: report of a series and review of the literature. Br J Dermatol. 2006; 155(4):714–721. Dalakas MC. High-dose intravenous immunoglobulin and serum viscosity: risk of precipitating thromboembolic events. Neurology. 1994;44(2):223–226. Sakem B, Matozan K, Nydegger UE, Weigel G, Griesmacher A, Risch L. Anti-red blood cell antibodies, free light chains, and antiphospholipid antibodies in intravenous immunoglobulin preparations. Isr Med Assoc J. 2013;15(10):617–621. Grosse-Wilde H, Blasczyk R, Westhoff U. Soluble HLA class I and class II concentrations in commercial immunoglobulin preparations. Tissue Antigens. 1992;39(2):74–77. Kahwaji J, Barker E, Pepkowitz S, et al. Acute hemolysis after high-dose intravenous immunoglobulin therapy in highly HLA sensitized patients. Clin J Am Soc Nephrol. 2009;4(12):1993–1997. Quinti I, Pulvirenti F, Milito C, et al. Hemolysis in patients with antibody deficiencies on immunoglobulin replacement treatment. Transfusion. 2015;55(5):1067–1074. Wilson JR, Bhoopalam H, Fisher M. Hemolytic anemia associated with intravenous immunoglobulin. Muscle Nerve. 1997;20(9):1142–1145. Jain RS, Kumar S, Aggarwal R, Kookna JC. Acute aseptic meningitis due to intravenous immunoglobulin therapy in guillain-barre syndrome. Oxf Med Case Reports. 2014;2014(7):132–134. Harbo T, Andersen H, Jakobsen J. Long-term therapy with high doses of subcutaneous immunoglobulin in multifocal motor neuropathy. Neurology. 2010;75(15):1377–1380. Dimachkie MM, Barohn RJ, Katz J. Multifocal motor neuropathy, multifocal acquired demyelinating sensory and motor neuropathy, and other chronic acquired demyelinating polyneuropathy variants. Neurol Clin. 2013;31(2):533–555. Erdmann PG, Lindeman E, Cats EA, van den Berg LH. Functioning of patients with multifocal motor neuropathy. J Peripher Nerv Syst. 2010; 15(2):113–119. Vanhoutte EK, Faber CG, Merkies IS, PeriNomS Study Group. 196th ENMC international workshop: outcome measures in inflammatory peripheral neuropathies, 8–10 February 2013, Naarden, the Netherlands. Neuromuscul Disord. 2013;23(11):924–933.